The AT&T Office@Hand Desktop App allows you to initiate conference calls on your computer, as well as your desk phone, smart phone, or tablet. Hosts and Participants may join the conference by tapping the link on the invite. When enabled, Participants may join the conference before the Host logs in. Tap the Conferencing button on the AT&T Office@Hand Desktop App dashboard to access and start conferencing. From here you can take note of the Dial-in number, Host access and the Participant access codes. Select the Dial-In Number from the drop-down list. This number is what your Participants will call to join the Conference. Users have a Host access code and a unique Participant access code. These codes are used when joining a Office@Hand audio conference. The Host access code permits the Host to manage the Conference via Touch tone commands. The Participant access code allows participants to join the Conference. Participants also have access to Touch tone commands to manage their Conference settings. 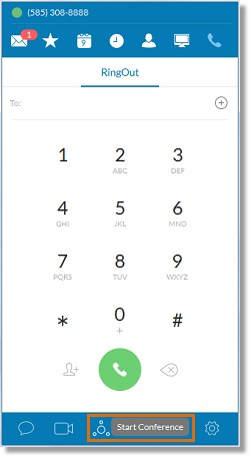 When sending invites to International Participants, you have the option to Include additional dial-in numbers, so your International Participants can dial a local number where they are located. 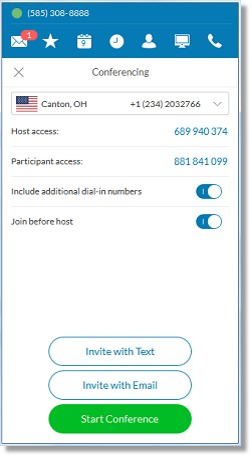 A link where Participants can find the list of additional dial-in numbers is also included in the invite when this option is enabled. Toggle the button to enable or disable this feature. When turned on, participants can join the Conference even without the Host. Allows the Host to invite Conference Participants via Text message. See Inviting Participants with Text to a Conference Call. Allows the Host to invite Conference Participants via Email. See Inviting Participants with Email to a Conference Call. Allows the Host to start the Conference immediately after clicking the button. See Starting a Conference Call for more information.